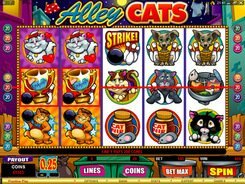 Developed by Microgaming, Alley Cats is a 5-reel 9-line slot machine with all kinds of kitties who love to bowl. 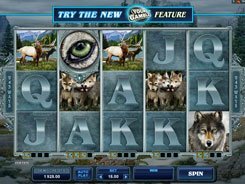 The slot is full of action to keep you motivated while spinning the fantastically designed reels. 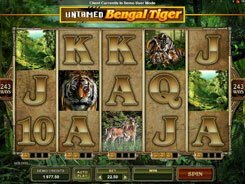 You can select a coin value of $0.01 to $0.25 and wager up to 20 coins per line. 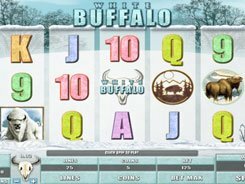 The maximum jackpot win in the slot machine is 10,000 coins. 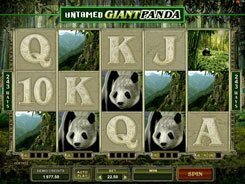 Three or more scatters (Strike symbols) dropped on adjacent reels starting from reel 1, randomly trigger the Mystery Prize bonus or the Free Spins round. 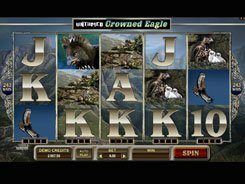 If free spins have been activated, you get up to 20 free spins with all payouts doubled. If the Mystery Prize bonus has been activated, you should pick three of six items to throw a bowling ball at. There is a specific cash prize underneath each item, with a maximum total of 2700 coins. Anyway, the incredible bonus features and a funny gameplay make up for the lack of a wild symbol. PLAY FOR REAL MONEY!